While a few people recommended them, I didn’t expect the Blarney Castle Gardens to be so diverse and fun to explore. One of my favourite parts was the Poison Garden. This fascinating collection of poisonous plants sits in the shadows of the castle and is intended to be an educational exhibit that informs visitors about the toxic plants that grow around us. It contains a collection of poisonous plants from all over the world including Wolfsbane, Mandrake, Ricin, Opium and Cannabis. Many of these are labelled with information about their toxicity and traditional and modern uses. A large number of plants that we now know to be toxic were once used widely as herbal remedies for all sorts of ailments. Upon entering, visitors are given specific warnings to which they better take heed; no one is to touch, ingest, or even smell any of the vegetation located behind the black gate. Parents who are willing to take their children on this tour must keep a very close eye on their young ones at all times. The cost of disobeying the rules in this garden are much more severe than a grounds-keeper scolding. The signs posted in front of each plant provide some interesting information about not only their toxicity, but also the various ways they have been used throughout history. A sign on a wall nearby notes that the site of the garden may have once been used to plant a “physic garden,” common in medieval Europe. My mind wandered to the people who once inhabited the castle and what medicinal or culinary horticulture they might have practiced. As I read each sign I noticed plenty of Harry Potter references that I didn’t get because I’ve never read the books. Enthusiasts of the series will, no doubt, enjoy seeing some of the plants mentioned in the stories among the garden’s offerings. While the trumpet plant Brugmansia was described by the duchess as “an amazing aphrodisiac before it kills you” and relaying that Victorian ladies sprinkled the pollen in their tea for LSD-inspired effects, further research into this plant suggests that the kind death it serves up is nowhere near pleasant – causing sweat-soaked convulsions and foaming at the mouth. Even with the strict guidelines in place, visitors still on occasion succumb to the effects of the plants each year, most commonly by passing out from sniffing a few too many toxic fumes. The garden’s laurel hedges also grow wild in some parts of Britain, and have caused numerous deaths outside Alnwick. Locals who cut down the laurel hedges and attempt to haul them away in trucks often end up crashing when the freshly cut branch fumes put them to sleep while driving. It was this paradox—along with a trip to the infamous Medici poison garden in Italy—that set Duchess Jane Percy of Northumberland’s “toxic” dream in motion. The Duchess wanted to transform the disheveled castle gardens into a unique tourist destination that would, oddly enough, appeal to kids. 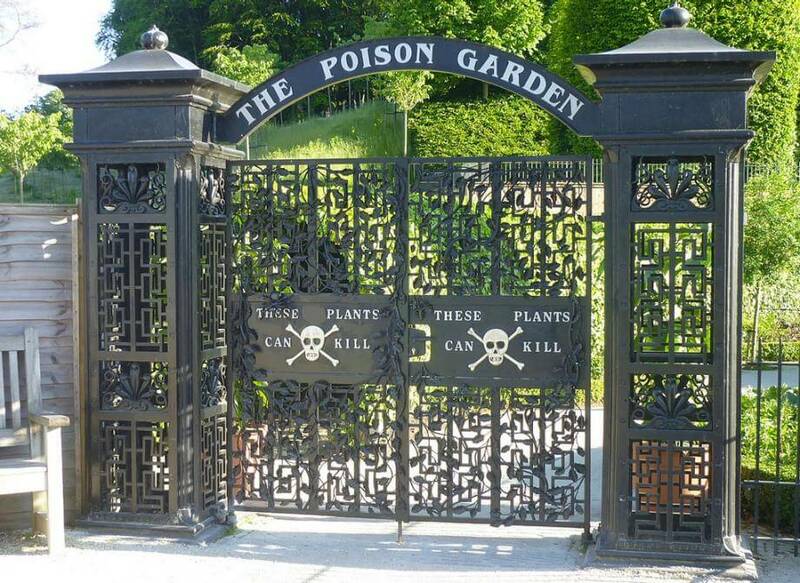 The garden has an additional section for plants that are ‘toxic’ in a different way. Duchess Percy has included a section in which she grows a variety of plants typically sought for drug use, from cannabis to cocaine. She and the guides use this portion of the park as a lead-in for drug education. “It’s a way of educating the children, without them knowing they’re being educated” she says. A natural narrative on death and drugs: not exactly two topics that might be of immediate interest to children, but ones that you will surely encounter near Alnwick Castle.